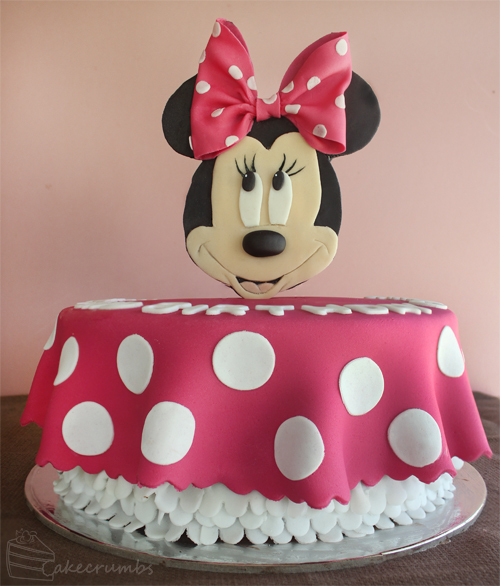 We spent a bit of time talking about whether it was going to be a 3D Minnie Mouse cake, or a cake made in the style of her instead. She opted for something that was midway in between. The cake itself is stylised after her dress. I made a few layers of ruffles at the bottom to represent the frilled briefs she wears under her skirt. 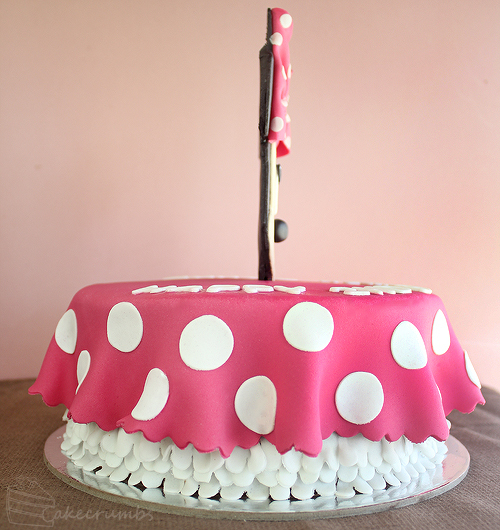 Then I draped the fondant over, giving it a scalloped edge to match all the frills. Last of all I covered it with polkadots. 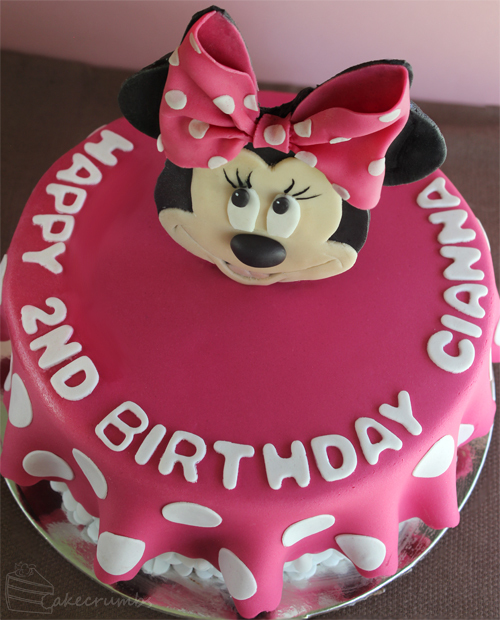 Minnie appears most frequently in red, but we went with the hot pink version to match the birthday girl’s favourite colour. At first we spoke of just having mouse ears and a bow on top, but my cousin said she might not recognise the character from ears alone so suggested instead having her face on top. I went with making a 2D cake topper and having that standing up on the cake instead. That feat was certainly precarious, more so when my cousin asked to pick the cake up a day early. I was worried it wouldn’t have time to dry, but thankfully it managed to stay upright. While the topper was 2D, there were a couple of features I thought should be 3D instead: her nose, and of course her bow. The bow was definitely a challenge. I tried making the fondant as thin as I could to avoid making the whole thing top heavy, but of course it still did so. I ended up having to put an extra layer of fondant behind it as the whole thing started to crack at the ears. (I’m also really terrible at fidgeting with sugar work and not leaving it dry properly, so that certainly doesn’t help!) That did the trick and the day was saved! The inside of the cake was my usual chocolate mudcake, layered and covered with whipped chocolate ganache before the fondant was applied. As usual you have done a wonderful job! I wish you belonged to my family! Wow….beautiful!!! 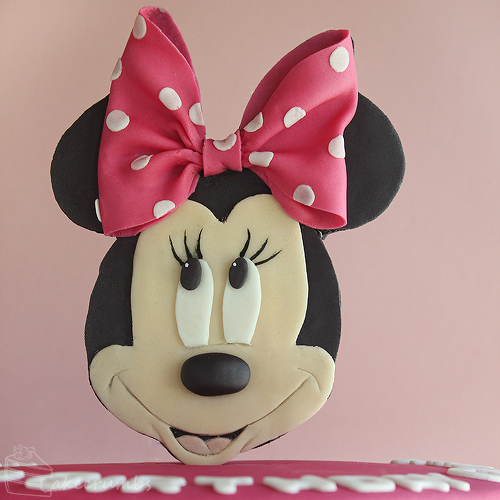 How did you get Minnie’s head to stand upright? Thank you. 🙂 There’s two small wooden skewers running down the centre of the fondant and into the cake. This is so lovely. Pleas what did you use for the scallop edge?